While reading Genesis recently, I started pondering my family’s level of busyness and the copious amount of activity being undertaken recently. The children are exceedingly busy with the demands of their rigorous Catholic school…demands which, lately, cause me to question whether I’m only burdening them, rather than blessing them. I’ve found myself in the habit of adding on work hours for financial gain, which seems reasonable at the time of scheduling; then, when the time comes to apply myself to those hours, I see them as possibly mistaken priorities. There are myriad examples of this in our lives right now. There is not a lot of rest. Is busyness a sin? Not necessarily. It is a curse, a “human condition,” a state over which we have some control and an obligation to discern. However, it seems presumptuous to think we can or should seek to escape it entirely, as God does not tell us in Scriptures that we are to kick back from the rigors of our responsibilities and let someone else shoulder our burdens on earth. While we might find ourselves burdened with the work involved in our day to day lives, the sin is not in the busyness and the tending to these responsibilities, but rather, the failure to stop for a while, giving to God some time each week to be replenished spiritually and physically. From this survivor of the flood would come the generations leading to the birth of our Savior, within Whom we find eternal peace and true rest. Jesus Himself gives us the Bread from Heaven. He feeds us the Bread of Life in the Holy Eucharist, and we do not have to work for this at all. From sin we are cursed to eat bread in the sweat of our face; in Jesus Christ, we are fed with the very Sabbath Rest Himself, Who takes away the sins of the world, has mercy on us, receives our prayers, and feeds us personally. WHOA. Sometimes, I wake up on Sunday mornings wishing I could just sleep in. Getting all our kids out the door seems like work, not rest. I confess to having done my share of grumbling. But look what happens so humbly and miraculously each and every Sunday. Jesus feeds us with His Body and Blood, giving us Bread from Heaven as the antidote to our cursed humanity. 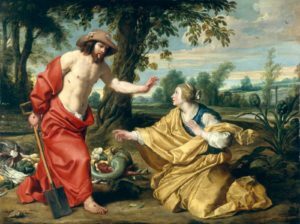 There is salvation one-on-one by the Gardener Himself.